Opinion | Is Buddhism compatible with Marxism? Sydney, Australia -- In 2010 the Dalai Lama - a major leader of a major religion - declared himself “half Marxist half Buddhist”. First we must ask questions about Buddhism itself. Is Buddhism a single religion, or even a religion? Would the two main streams of Buddhism constitute a schism? The Dalai Lama is the largely undisputed global figurehead of Mahayana Buddhism. There is no equivalent figurehead in the other dominant stream, Theravada, which stretches from South Asia to South-East Asia. Both streams are practiced widely as a “religion”, with the Buddha treated more as a deity than a guru (teacher). Theravada has also many local customs and practices in countries where it is practiced, and both streams have rituals, incense burning, prayer and chanting. In both traditions, most leading monks would agree that such practices are mambo jumbo, and of little or no value other than to bring money into the temples and monastic order. Many lay Buddhists also shun such irrelevant practices so that meditation, a sophisticated approach to human psychology, and intellectual understanding remain the main instruments of the widespread Buddhist cognoscenti. After 2500 years, one would expect there to be some mystical, exaggerated and fantastic additions to the original belief, and perhaps even deliberate distortions. It is still very clear that what Buddha established is a rich philosophical tradition and an outstanding philosophical contribution. 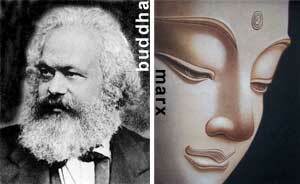 From a Marxist viewpoint, Buddha was an early materialist who touched on dialectics. Buddha would have been aware of the debate about the relationship of “absolute” to “relative” but not any dialectical resolution of that debate. Whereas Hinduism embraced the absolute, the rebellious Buddha taught about the relative world, the real world. His teachings are anchored in everyday life and all living things. However, many of the accepted ideas of the time find currency in Buddha’s expression and Buddhist traditions: sexism, caste-ism, polytheism and migration of souls, for example. But Buddha's primary polemic or treatise was: 1. There is suffering, 2. Suffering has a cause, 3. That cause can be eliminated, and 4. This is the path to defeat it (the eightfold path). The most fundamental laws he identified were that of “cause and effect”, and “everything changes”. This puts him squarely in the modern dialectical materialist camp. Another 2400 years of philosophical debate would have been of assistance to him then. However, “karma” is implicitly elevated to mystical status and nirvana/nibbana is described as an absolute state (Marxists might say “qualitatively different state”). Pleasingly, caste-ism, (poly)theism, and the soul were trashed along the way, implicitly if not explicitly by the Buddha. Buddha eventually did admit women into the monk-hood, but they faced additional requirements, so we are yet to see a satisfactory outcome. The Dalai Lama acknowledges Marxism’s moral character and condemns capitalism, but fails (at least publicly) to acknowledge Marxism’s philosophical validity. But many on the left don’t really have much of an idea of what dialectical materialism is exactly about either. In my 40 years on the left in Australia, having attended numerous political classes delivered by Marxist parties, I have never attended, or been aware of, a single class explaining dialectical materialism — the philosophical foundation of Marxist theory. Historical materialism classes in socialist circles, by comparison, are a dime a dozen. Buddhism and other philosophical systems scarcely touch the horizon of the organised left. The left in Australia has a serious deficiency in coming to grips with it's philosophical foundations, a deficiency which appears to mirrored in the international Buddhist community.